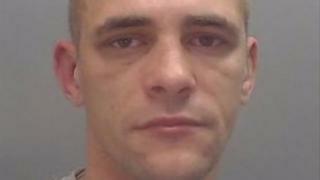 A robber who bit a hole in a police officer's ear as he tried to evade arrest has been jailed. Daniel Ward, 26, "tore flesh" from the PC's ear while being arrested on suspicion of assault on Bridge Street in Runcorn on 14 December last year. He had to be restrained by several officers and threatened to bite them while in custody, Cheshire Police said. Ward, of Eagles Way, Runcorn was jailed at Chester Crown Court for 13 years with four years on extended licence. He pleaded guilty to wounding with intent, resisting arrest and a public order offence. The male officer was left with a serious injury that required surgery. Ward was also found guilty of robbing bicycles from a woman, 18, and a boy, 17, at knifepoint in a subway on 30 January 2018. He pleaded guilty to possessing an offensive weapon in a public place after threatening them with a knife near The Knoll in Runcorn. Det Con Nathaniel Walkowiak said Ward "subjected two young people to a terrifying ordeal... threatening them with a knife [and then] he tore flesh from the ear of a police officer." "His victims will never be able to forget the ordeals he put them through", he said.